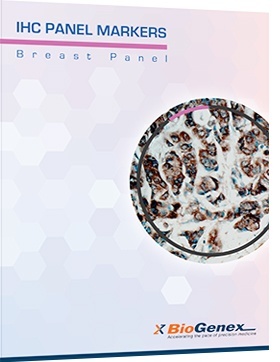 BioGenex Breast IHC Panel Markers include specific antibodies useful for the analysis of breast tissues. The panel is meant to help customer easily find appropriate antibodies for their testing. All BioGenex primary antibodies are quality controlled and tested to provide optimum immunohistochemical staining when used with the appropriate BioGenex detection system. The correct optimization of antibody and detection system minimizes the potential for false negative or false positive staining. HER2 (human epidermal growth factor receptor 2), also known as Neu, ErbB-2, CD340 (cluster of differentiation 340) or p185, is a protein that in humans is encoded by the ERBB2 gene. HER2 is a member of the epidermal growth factor receptor (EGFR/ErbB) family. Calponin is a smooth muscle specific, actin-, tropomyosin- and calmodulin-binding protein thought to be involved in regulation of actomyosin as well as the regulation or modulation of contraction. Estrogen Receptor-Alpha (ER Alpha) is a nuclear protein and member of the steroid hormone receptor family. ER Alpha possess both DNA binding and ligand binding domains, and exerts a significant role in activating the transcription of certain genes.